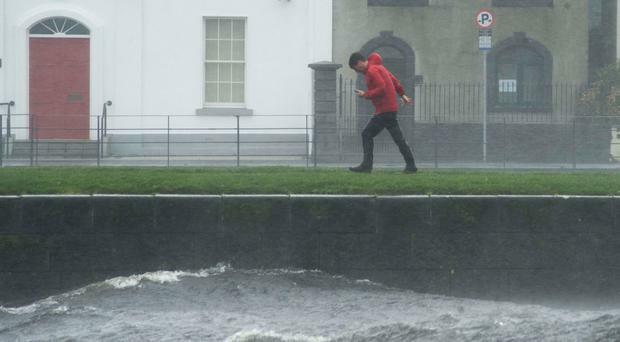 Met Éireann forecaster Harm Luijkx said that Storm Ophelia was completely different to other weather events that have been seen before in Ireland - with almost no rainfall in parts. "There was a bit of rain in the west, but in the east it was almost completely dry," he said. The forecaster said there was even some sunshine to be seen. "The rain was always forecast to stay mostly over the Atlantic, with any rain hitting mostly the west of the country and that is what happened," he said. "At some stations in the west, there were up to 20 to 25mm of rain, which is really not extreme. "We had some yellow rainfall warnings out for that. But then in the east, there was barely one or two millimetres of rain," he said. "That is how it developed, which is how it was forecast. The reason why it was so strange is that it was a completely different kind of storm than we have seen before. "It was a hurricane that came up straight from its place of origin, where it developed near Africa, and normally it would cross the Atlantic and go to the Caribbean or America. "This one went straight northwards towards Ireland basically, across the Atlantic. "It stayed really east of the Atlantic. "It kept the stages of a hurricane until close to the Irish shores, and then turned to a tropical storm, still with the very strong winds." However, there was significant rain over the Atlantic during Hurricane Ophelia, and this did show up on the radar. While the west did experience rainfall, it did not receive any more than would be typical on a very rainy day. Mr Luijkx said it was unusual for it to remain so dry in the east while experiencing the storm - however he explained that there are a host of technical meteorological reasons for this. The rainfall during the last comparable event - Hurricane Debbie in September 1961 - is not recorded on its website report of the incident. It states that gusts of wind reached 180kmh at Malin Head. But the lack of rainfall can be measured by another serious weather event that occurred six years ago. On October 24, 2011, Met Éireann recorded an exceptional weather event when the greater Dublin area experienced very heavy rainfall. The heaviest rainfall saw Dublin Airport reporting a maximum nine-hour rainfall of 66.8mm.